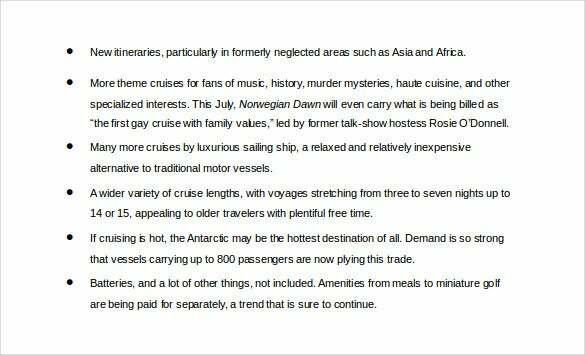 Going on a cruise is surely an elaborate affair. Coupled with the fact that people tend to relax and sleep in, there are times when they miss out on some important destinations and events on the cruise. This could lead to confusions and even a bad publicity. 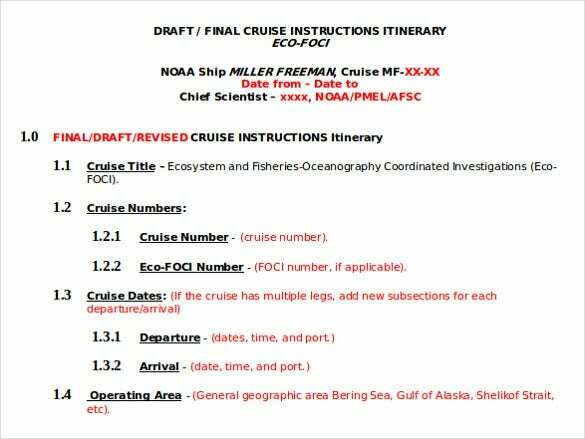 Avoid all this with a perfect cruise itinerary that would keep everyone informed. 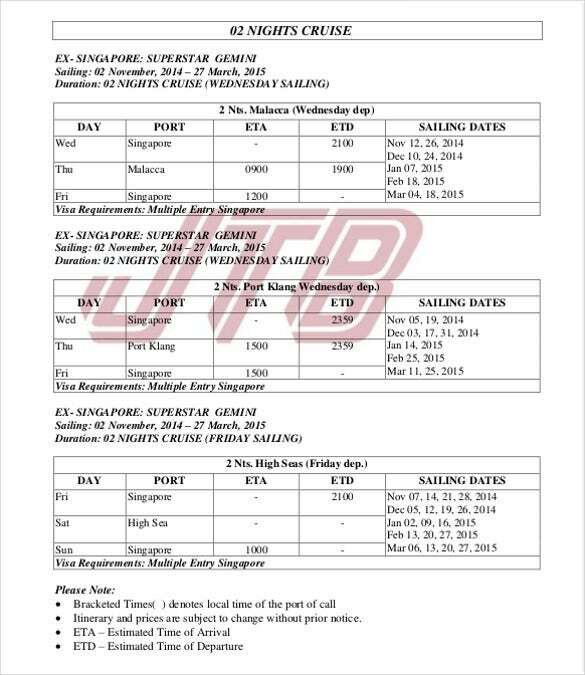 You can also See Travel Itinerary Template. This travel itinerary template is super simple to customize and edit. Download it first and then you can make all the edits in the template. You insert all the required specifics regarding your travels to the different places you’re going to visit – include dates and times of arrival etc. 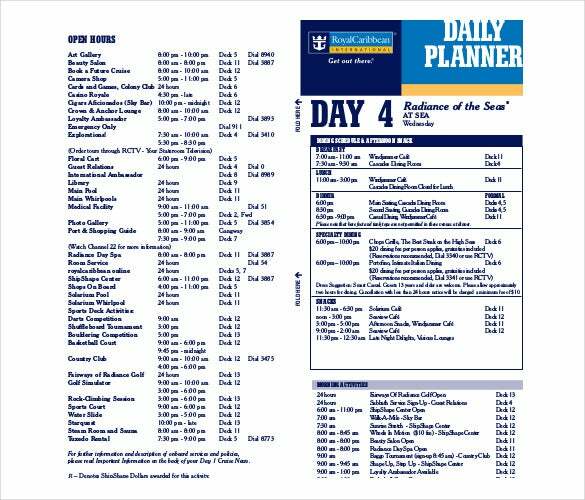 You can also see Itinerary Template. 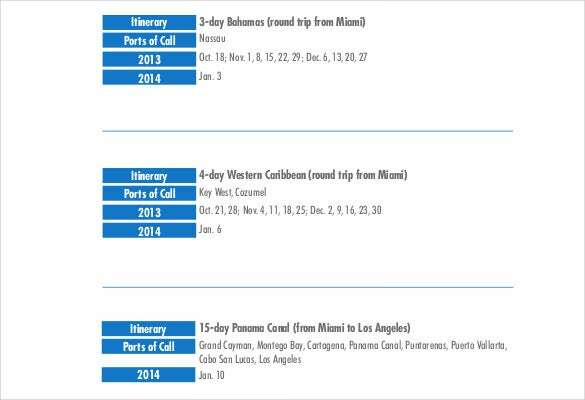 This is a great-looking cruise itinerary template that you could download and use. The format is a fully editable one, and user can easily insert names of the destinations and also the estimated date and time of arrival and departure for each. This is a customizable sample, carrying it along on your travels would spare you from confusion. 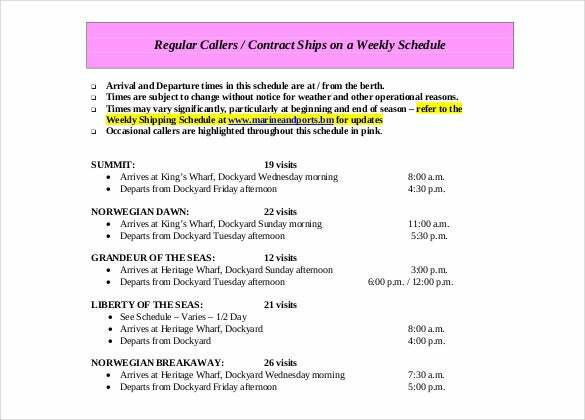 udel.edu | This is a sample Travel Travel Cruise Itinerary template used by Cruise Organizers to advertise the different cruises they offer and also to talk about the upcoming ones. 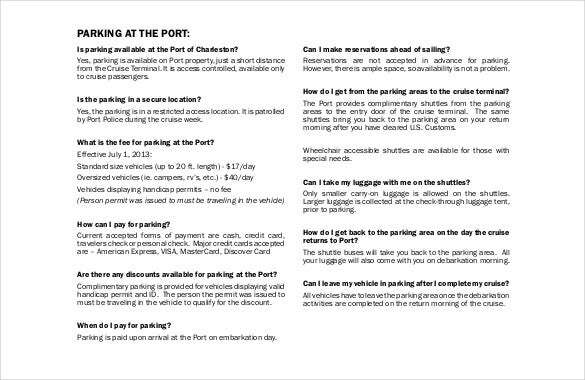 scspa.com | This is a parking guideline template for parking at the port ahead of a cruise. It gives a detailed FAQ , which can be edited to answer all the queries one might have with respect to parking their vehicles before a cruise. ics-shipping.org | As the name suggests, this template is a safety training template for all passengers onboard ahead of sailing. 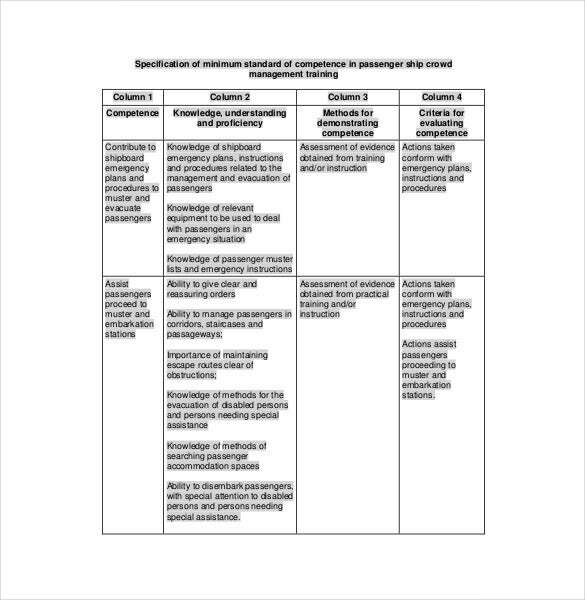 This can act as an essential toolkit for defining competence at various levels to the passengers. 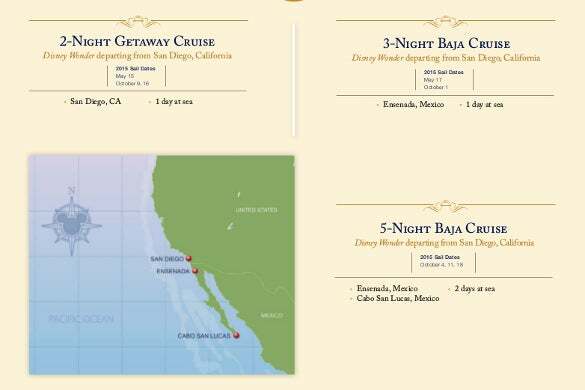 royalcaribbean.com | This Cruise Campus Itinerary Template can be used to detail an entire cruise trip by a cruising company. It mentions all the stop-overs and activities on those stop-overs to its passengers with a detailed schedule. 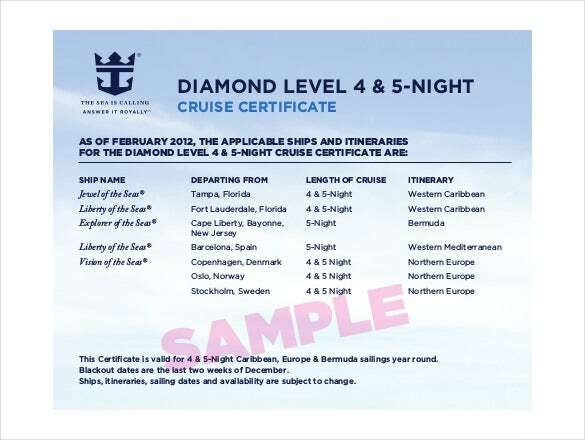 royalcaribbeanincentives.com | This template can be used by a cruising company to advertise about their upcoming cruises. It gives the name of the ship departing and arrival ports, timelines etc. 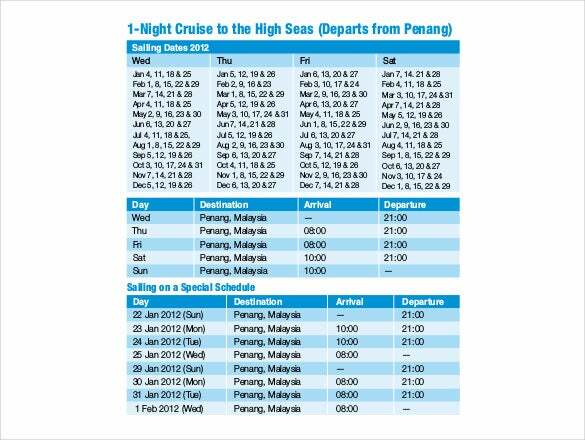 starcruises.com | This is a Cruise schedule which is distributed to all passengers ahead of the cruise and it gives a day-wise break up of the different places it will cross and stop over. 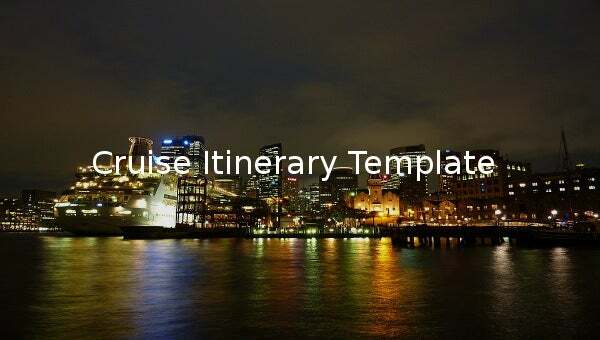 cityofhamilton.bm | This Cruise Port Schedule is a template which can be customised to mention the sea schedules of the different ships for a particular cruising company. It is a neat template. 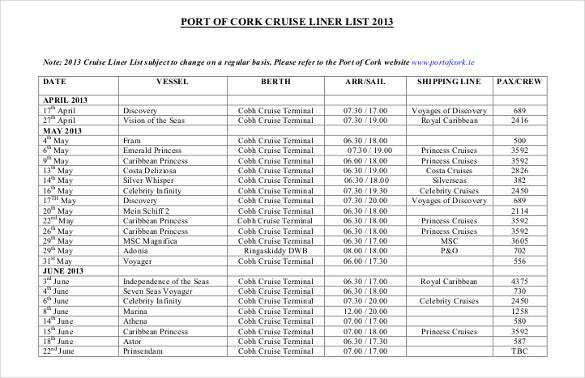 cobhharbourchamber.ie | This template lists the vessels scheduled for sailing; over the next few weeks and the all details related to the cruise, like the dates, number of passengers etc.